Mike and Ashley go to church in Episode 4 at St. Luke’s Episcopal Church. The church is located 9 blocks from the Real World DC house. Interestingly the path that Mike and Ashley walked from St. Luke’s took them north for 4 blocks on 15th Street NW and then left (west) on S Street over to the Real World DC house. This path took them first behind and then along the side of the Supreme Council, one of the important buildings mentioned in The Lost Symbol by Dan Brown. In the Episode 4 you can see the Supreme Council as Mike and Ashley walk behind it. It appears again in the background as they walk along S Street toward the Real World DC house. 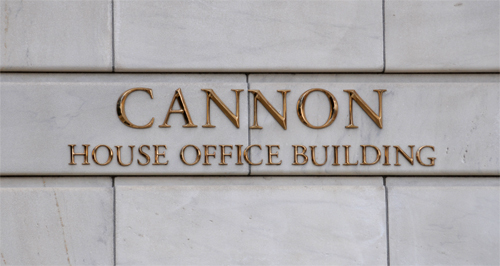 As Dan Brown points out in his novel, this is a striking but at the same time little known building in Washington DC. Click Supreme Council to see the StationStart.com entry about the unusual building in Washington DC. 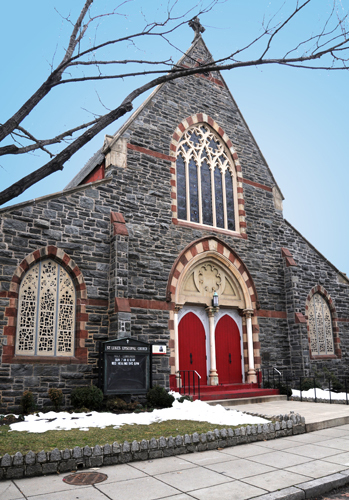 St. Luke’s Episcopal Church is located at 1514 15th Street NW, Washington, DC. Click Here for Google Map showing the location of the church. Closest Metro Station: The Dupont Circle Metro Station on the Red Line is nearest to the St. Luke’s Episcopal Church, but the U Street/African-American Civil War Memorial/Cardozo Metro Station on the Green and Yellow Lines is only a little bit further away. Callie, Ashley and Erika have lunch at Lauriol in episode 3 or Real World DC. Callie ordered Sunshine Salad, and Ashley asked if she ever missed meat. Callie said she was never a big meat eater, avoiding red meat in favor of chicken or fish. She went on to say that her Mom had been hard on her. 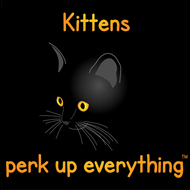 She was a personal trainer and aerobics instructor and was always talking about food. According to the restaurant’s Website, it won an award for best Mexican food in 2002, and someone described it as one of the best Spanish restaurants. They definitely serve Mexican food, and they also have paella. 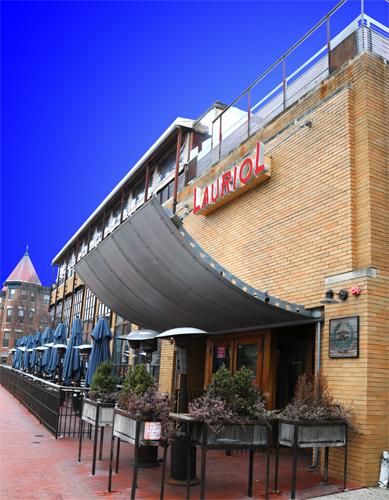 Lauriol Plaza is located at 1835 18th Street NW, Washington, DC. 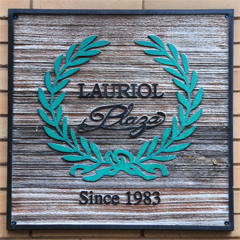 Click Here for Google Map showing the location of Lauriol Plaza. Closest Metro Station: The Dupont Circle Metro Station on the Red Line is nearest to the Lauriol Plaza Restaurnat. There are some signs near the Real World DC house that show up in multiple episodes, so I thought I would dedicate this entry to signs at or near the house. 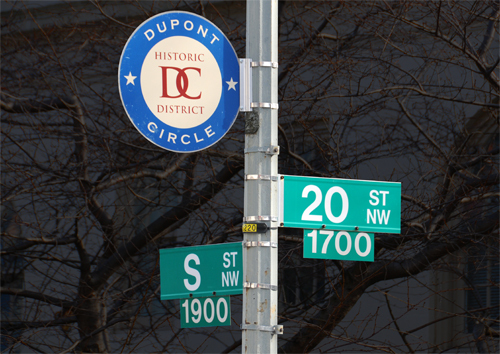 The Dupont Circle DC Historic District sign above shows up repeatedly in the series. Actually there are two such signs where the house is located at the intersections of S Street NW with 20th Street NW. 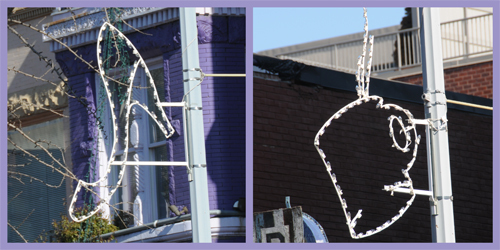 The one shown above is on the southeast corner of the intersection, just across 20th Street NW from the house. The other circular sign is located on the northwest corner of the intersection, just across S Street NW from the house. 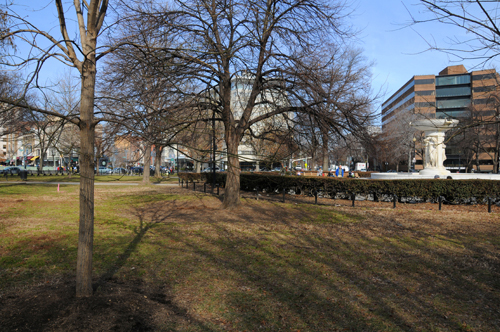 Click Here for Google Map showing the location of the Dupont Circle DC Historic District circular sign that appears in several episodes of Real World DC. 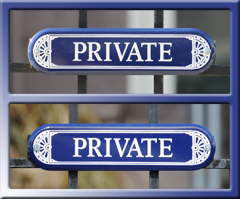 There are two PRIVATE signs on metal gates leading into the house. The gates are located right at the edge of the sidewalk. 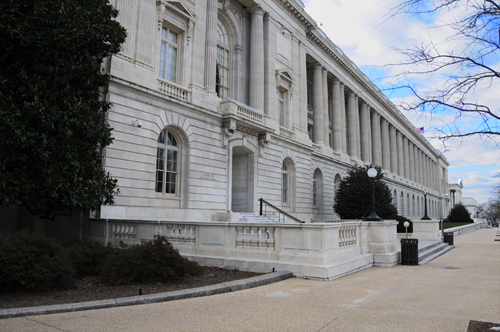 In the image, the one at the top is located at the entrance that faces 20th Street NW. The essentially identical sign at the bottom is located at the entrance that faces S Street NW. The S Street entrance is the one with the steps that appears frequently in the show. Interestingly enough and as far as I know never mentioned in the show is a sign on the sidewalk right in front of the house. It is on the top of the storm drain on S Street. It identifies the area as part of the DC Soil & Water Conservation District and points out that whatever goes into that storm drain will end up in the Potomac River. Click Real World DC House to see the StationStart.com entry about the house located at 2000 S Street NW. In the picture at the top of the entry S Street NW is the street to the right, and 20th Street NW is on the left. The house is located on the southwest corner of the intersection. Closest Metro Station: The Dupont Circle Metro Station on the Red Line is nearest to MTV’s Real World DC house. 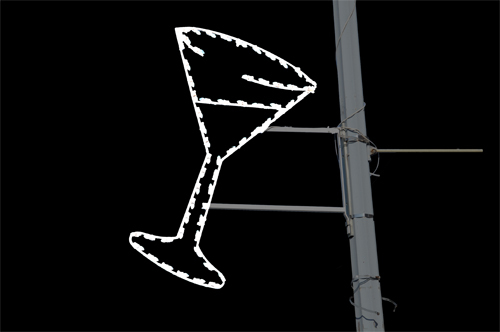 Nothing really happens around this martini glass light, but it shows up repeatedly in the Real World DC series, often as the houseguests head out for dinner or a night on the town. This light is located about four doors down from The Diner where Andrew, Ashley, Callie, Emily, Erika, Josh, Mike and Ty had breakfast in Episode 2. Click The Diner – Real World DC to see the StationStart.com entry about the houseguest breakfast at The Diner in Episode 2. The cocktail glass light that appears in several episodes of Real World DC is located on the light pole right in front of 2445 18th Street NW, Washington, DC in Adams Morgan. 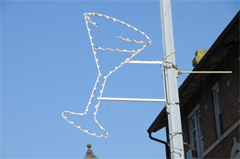 Click Here for Google Map showing the location of the cocktail glass light. In the next block to the south, on the same side of 18th Street NW (the eastern side), there are two similar, lights attached to different light poles. As far as I know neither of these has appeared in the Real World DC show. One, a high heel shoe, is located in front of 2335 18th Street NW. Click Here for Google Map showing the location of the high heel shoe light that is similar to the cocktail glass light that appears in several episodes of Real World DC. The other, a steaming mug of coffee (or perhaps tea or hot chocolate), is located in front of 2311 18th Street NW. 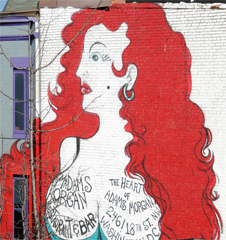 Click Here for Google Map showing the location of the steaming mug light that is similar to the cocktail glass light that appears in several episodes of Real World DC. Photoshop Note: The photograph at the left is the original version of the nighttime photograph at the top of this entry. It was taken on a bright January day. After some work in Photoshop, the picture was modified to look more or less like it was taken at night. In Episode 4 of Real World DC what looks like the all the houseguests (Andrew, Ashley, Callie, Emily, Erika, Josh, Mike and Ty) head out to dinner at Russia House Restaurant and Lounge located at the corner of Connecticut and Florida Avenues NW, Washington DC. I believe this is an early stop in a night of partying. 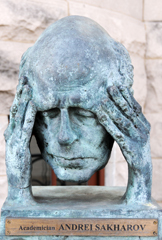 Interestingly outside the restaurant is a bronze sculpture of academician Andrei Sakharov by sculptor P. Shapiro. 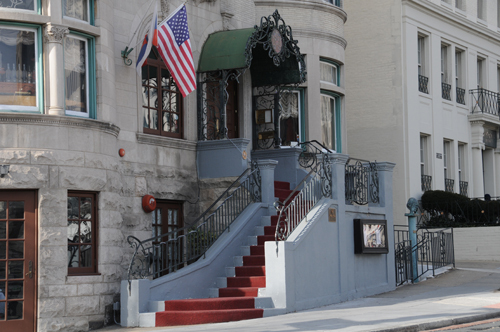 The Russia House Restaurant and Lounge is located at 1800 Connecticut Avenue NW, Washington, DC. 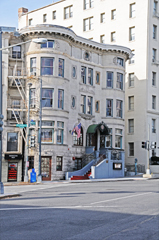 It is just across Connecticut Avenue from Buca Di Beppo, the restuarant the houseguests visited in Episode 1. Russia House is only about a block and a half from the Real World DC house. 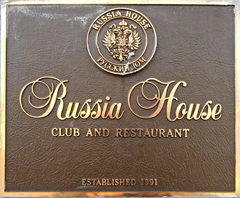 Click Here for Google Map showing the location of Russia House Restaurant and Lounge. Closest Metro Station: The Dupont Circle Metro Station on the Red Line is nearest to Russia House. Late in Episode 4 of Real World DC all the houseguests, Andrew, Ashley, Callie, Emily, Erika, Josh, Mike and Ty, head out to get something to eat. They end up at Subway. 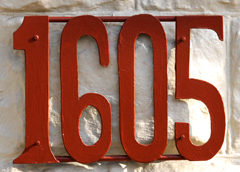 This place was easier to find than most of the things on the show, because they showed the address, 1605, in huge easy to read numbers. 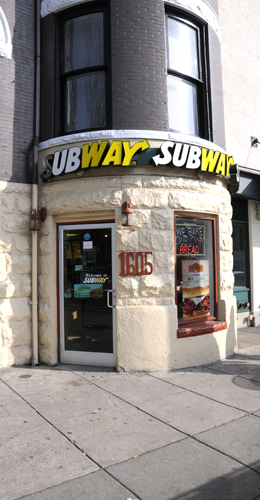 The Subway the houseguests visited at the end of Episode 4 is located at 1605 Connecticut Avenue NW. Click Here for Google Map showing the location of the Subway sandwich shop visited by all of the houseguests. Closest Metro Station: The Dupont Circle Metro Station is nearest to this Subway. In Real World DC Episode 4, following the difficult dinner at the Big Hunt Restaurant, Ashley and Mike took their disagreement outside. They walked and argued, argued and walked mostly along Connecticut Avenue NW near Dupont Circle. 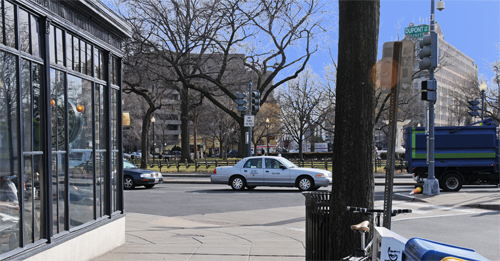 For the first shots of Ashley and Mike arguing outside, they were standing on the east side of Connecticut Avenue on the north side of Dupont Circle. This is about a block and a half from the restaurant walking in the direction of the Real World DC house. Click Here for Google Map showing the location of Location of the first part of Ashley’s and Mike’s argument following dinner at The Big Hunt restaurant. Soon enough they moved a little bit further up Connecticut Avenue, stopping to argue at the corner of Connecticut Avenue and Q Street NW. Click Here for Google Map showing the location of Location of the second part of Ashley’s and Mike’s argument at the corner east of Connecticut Avenue NW and south of Q Street NW. Interestingly enough, just across Q Street NW and visible during this argument is Firehook Bakery where Emily and her sister Amy had coffee during Episode 2. Click Firehook Bakery StationStart.com entry About Emily and her sister Amy having coffee there. 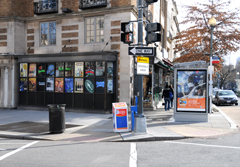 Closest Metro Station: The Dupont Circle Metro Station is the nearest to the argument portion of Connecticut Avenue NW.